This morning I dropped by at a grocery store close to where I live after work for some groceries. When my refrigerator is empty, my niece would tease me. “There is nothing to eat in this house!” The next thing she does is go online, order pizza or burger and fries from her favorite food chain. There are advantages on my end when she orders take out. Less effort for me and I save on my utility bills. The thing is the accumulation of this food stuff does not guarantee good health and nourishment in our body. She is aware of it, and it is good she does it only on her pay days. Coming home and before I went to sleep I cooked, ate my lunch and still have something set aside for supper. I prepared pork chop and stir fried carrots for my niece. For me, tilapia cooked in coconut cream. I cooked white rice to go with the pork chop and fish. Microwave does its assignment when we are about to eat. My niece is not fond of veggies, although she likes some but very selective. For fish, she likes our native galungong. She might like tuna or lapu-lapu but I do not encourage her. These varieties of fish are more expensive than meat. She loves shrimps too. I would give in at least once a week, on her day off from work. 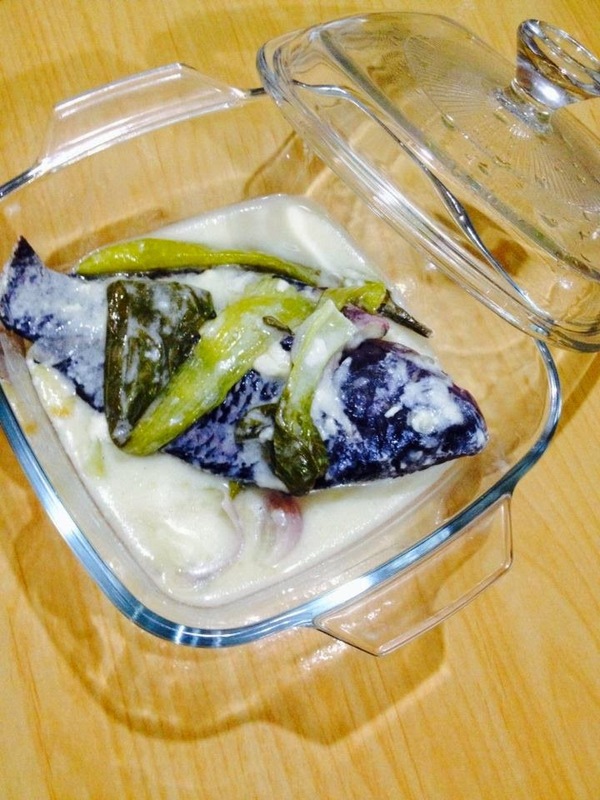 Cooking tilapia fish in coconut cream is simply effortless. I had the cleaner at the grocery store removed the gills, intestines and scraped off the scales. Soon as I got home, I washed the tilapia put them in a pan. I added leafy veggie, ginger, garlic, onion, laurel leaf, green pepper, pepper corn and half cup of water. I covered the pan and bring to boil in low fire. After five minutes I poured the coconut cream, prepared in a bowl with little amount of water. I used the ready mixed coconut cream complete with seasoning. I mixed coconut cream with water to avoid getting lumpy when poured on top of the fish. I let it simmer for about three minutes, then ready to eat. The tilapia tastes real good!